When buying a riding mower — especially if it’s your first one—you’ll be faced with many options. It can seem daunting to see all of the different sizes, brands, attachments, and models, but you can cut out a lot of the unnecessary work of finding the perfect riding mower by asking yourself (or a sales person) the right questions up front. Investing in a riding mower can help you tackle landscape projects and lawn maintenance with confidence and it’s important to enter the buying process with an open mind and your most important considerations. Has your health changed? Has the amount of space you need to mow changed? Do you need a new model for your landscaping services fleet? Why you’re buying a new mower is perhaps the most important question to ask yourself before you start visiting dealers or getting too deep into your research. If you can identify the reasons for wanting to make the purchase, you’ll have an easier time answering the rest of these important questions. 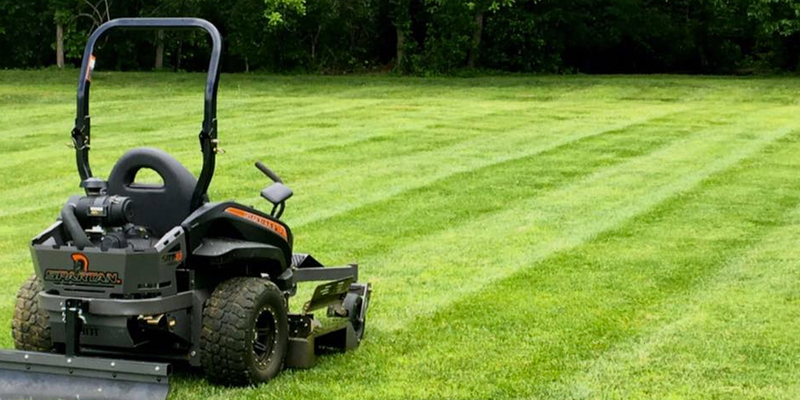 What’s the most important quality your new mower should have? Some people switch to riding mowers because they can’t physically handle all of the pushing anymore. They’re seeking something comfortable that can reduce the physical toll mowing a yard can take. For others, they want to cut down on the time they spend mowing. Even if it’s as trivial as something like a cup holder — figure out everything you want, and keep those items at the top of your list when you’re researching models and features. There’s little point in investing in a riding mower if you’re not going to enjoy using it. What type of terrain will you be mowing or navigating? The type of terrain you’re working with — its slope, obstacles, and flatness — can all impact how easily you’ll be able to mow, particularly with a riding mower. If you’re mowing around a lot of trees, bushes, or other obstacles, then maneuverability is something you’ll need to ask about. Similarly, the flatter, less “challenging” kinds of terrain won’t require a mower with significant horsepower, potentially resulting in a lower priced piece of equipment. What size mower deck do you want? The size of your mower deck should correlate to the size of the property you’re working on. Larger decks are needed to cut more grass in a shorter period of time; however, smaller decks offer better maneuverability. You should measure the width of various access routes and points, such as gate entries, storage areas, or anywhere else you may need to navigate the mower. Use your measurements to determine how large your mower deck should be. Do you need the riding mower to perform any other functions? Do you need it to bag grass? Are you interested in using attachments in the future? Identifying the primary use of your riding mower will help you understand whether the model you’re looking at is appropriate for your needs, or if it’s compatible with any attachments you might be interested in. When some owners purchase a riding mower, they’re looking for an all-purpose outdoor tractor — something that can tow a small trailer or be equipped with other essential attachments. Will you have local support for the mower you buy? This question may come later in the decision-making process but it’s an important one nevertheless. If you’re sold on a particular brand of mower, make sure that you’ll have access to a local dealer or reputable service center for parts, service and any routine maintenance your mower will need. Most dealers are trained extensively on the ins and outs of the equipment they sell, although it never hurts to verify this before you make such a big purchase.